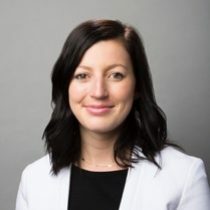 Maegan Bell, a trained physiotherapist, joined Mount Sinai Hospital team in 2012. The Acute Care for Elderly strategies was already implemented, which also involved the project of the Geriatric Emergency Department (ED). She believes that Senior Friendly care is a core concept in physiotherapy based on the population commonly seen in acute care. Her role in the ED is to assess patients who have sustained an injury or have a condition that impacts their functional mobility. Once medical investigations have been completed and the MD has determined that a patient doesn’t require admission to hospital, the PT/OT team are consulted to assess the patient’s strength, mobility and overall function. They then provide recommendations for equipment, assistive devices, community supports to return home, or suggest alternative discharge locations such as rehabilitation. Physiotherapists and Occupational Therapists (PT/OT’s) are an important part of the interdisciplinary team. They often assess patients together because we have similar interests in terms of a patient’s ability to mobilize and perform their activities of daily living, so our roles can somewhat overlap. We also work closely with the GEM nurses and social workers, especially for complex cases where creative planning and organization of resources may be needed to facilitate an appropriate plan/discharge. A one time consultation with a physiotherapist can have a tremendous impact on a patient. The older adult population is more vulnerable to adverse comorbidities in hospital, such as falls and deconditioning. Physiotherapists are important in assessing function, optimizing safety, help maintaining/restoring mobility and hopefully avoiding an admission. 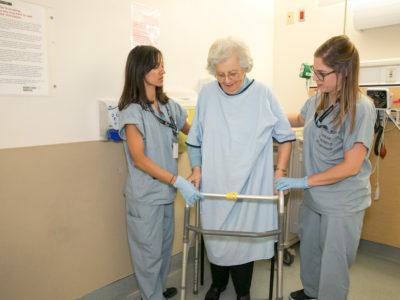 PT and OT work closely to facilitate a patient’s return to independence whenever possible or to provide recommendations for transition home if a patient is going home at a different functional level. When I asked Maegan to tell me a success story, she chose the same story that her colleague Seema, the occupational therapist on the team was proud to tell. It shows how close they work together! At the moment, physiotherapists at Mount Sinai Hospital in Toronto are only available for ED consultation during weekdays and on Saturdays. Maegan is convinced that a more designated PT/OT staff in the ED would likely benefit this Senior-Friendly ED initiative.